One of the many things that draw vacationers to Kiawah Island are the miles and miles of bicycle paths. Many islanders enjoy riding bicycles as a fun way to explore Kiawah. Not only is it great exercise, but you can see things that guests traveling by car cannot. With nearly 30 miles of trails, there are several bike paths that can get you from point A to point B and even some that will loop you around the island just to see the lush greens, lagoons, wildlife, and beach. Renting bikes on Kiawah has never been easier with our list of recommended bike rental companies. Many of them will deliver the bikes directly to your vacation rental! 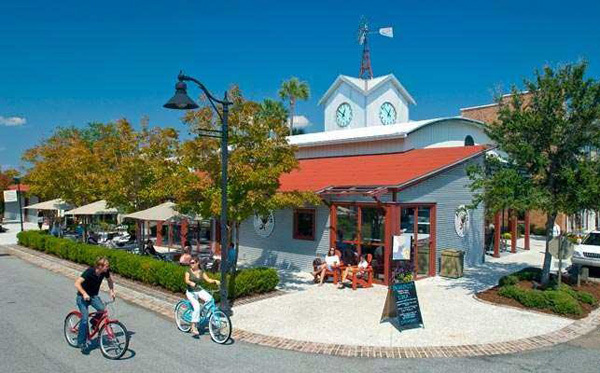 Now, read on for our favorite spots to bike on Kiawah Island. Many people visit Freshfields Village on a bike to pick up their morning coffee at Java Java or Starbucks. Guests can also eat lunch at King Street Grille, La Tela Pizzeria, or Ladles Homemade Soups. Afterward, you can grab some groceries at The Village Market and even shop in the adorable boutiques and beach stores. Just outside of the Kiawah front gate is an area called Mingo Point, which is famous for its seasonal oyster roasts and BBQs. Even if there isn’t an event going on, we would still recommend biking to the area and enjoying the marsh views. If you like adventure, you can park your bike and rent kayaks or paddle boards. If you enjoy fishing or crabbing, right across the pavement you will find locals gathered under a connector showing off their catch of the day. Night Heron Park is fun for all ages. Between the park, basketball court and Wildlife Center you will find hours of entertainment. They even have public grills that can be used by guests staying on the island. Vanderhorst Plantation is the name of the area on Kiawah beyond the second gate. In a car, guests have to show a special pass to be granted access, but on a bike, anyone can explore through the trails. Governors Drive is the main road that the bike path is on, but there are many side streets with gorgeous homes along your route. The Ocean Course is one of Kiawah’s five golf courses. This particular course is the most popular due to the 2007 Senior PGA and 2012 PGA championships. They have been lucky enough to be selected to host the same championship in 2021. While you’re there, take in the beautiful landscape of the courses and grab a burger at Ryder Cup Bar. The island also has three towers with amazing marsh views. One is located in West Beach, one is in the Vanderhorst Plantation and there is also a tower on Marsh Island Park. We recommend climbing up for the view! Lastly, the beach’s hard sand is perfect for bicycle cruising. Kiawah has many, many miles of beautiful beach which people can enjoy morning, noon and night. Whether you ride to the store, the park or the beach, we believe that sight-seeing on a bicycle is the best way to experience Kiawah Island. If these biking opportunities interest you, please call our office at 888.909.8110 or browse our Kiawah Island rentals to plan your vacation to the island. We would love to host your stay!